PanARMENIAN.Net - The first tornado warning in central Alabama, U.S. went out around 1 p.m. Sunday. In the hours that followed, a cluster of storms ripped through the Southeast, spawning multiple tornadoes, killing at least 23 and leaving a trail of rubble, The New York Times reports. As the storms pushed east, the tornadoes would leave a path of destruction that stretched from Alabama into Florida and Georgia. The reported deaths were all in Lee County, Ala., where two tornadoes — one at least a half-mile wide — wrecked homes and uprooted trees. It was unclear Sunday night whether the deaths had occurred in various locations or all in one place. Dozens of people were sent to hospitals. As darkness came, rescue workers searched for survivors, and more victims, often with little more than a flashlight or the lights of their vehicles to aid them. More than 150 people were part of the search-and-rescue operations near the Lee County communities of Smiths Station and Beauregard, which is about 60 miles east of Montgomery, said Rita Smith, a spokeswoman for the county’s emergency management agency. Sheriff Jay Jones of Lee County told reporters that 23 people had been killed. The East Alabama Medical Center in Opelika, Ala., had received more than 60 patients as of Sunday night, said John Atkinson, a spokesman for the center. He said the conditions of the patients varied. 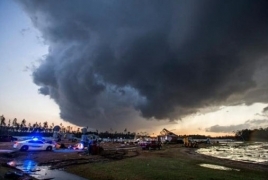 Nearly eight years after a tornado outbreak that devastated major cities and small towns alike, Alabama remains wary of severe weather and the menace of tornadoes. After the 2011 outbreak, which spawned more than 60 tornadoes in Alabama and led to more than 230 fatalities in the state, some communities ordered upgrades to storm shelters, and residents became extraordinarily sensitive about even the threat of poor weather.